We arrived in Paris early morning, and had a full three days to enjoy ourselves. It would be impossible to quite remember exactly what we did day by day, so I will give an overall breakdown of the things we did and the sights we saw. We decided to stay at Oops! Hostel, which was funky (in a good way!) to say the least. We met a bunch of other people our age, including some entertaining Aussies, whom we spent some time with at night. I love, love, loveeee all these gargoyles! Our tour guide in front of Vincent Van Gogh’s apartment! Montmarte’s Love Wall, which prints “i love you” in every language (well, over 250). I would absolutely love to come back here with the boyfriend, seems pretty romantic to sit on a nearby bench in this hidden spot and then take a stroll in one of the most romantic places in Paris. Along with the walking tours, we also decided to walk up the Notre Dame! This entailed us climbing 387 steps up a narrow stone, spiral staircase going straight to the top. The staircase is barely wide enough for one person to walk up! The glass-stained windows are an impressive sight from the inside of the Cathedral, although they don’t look like too much from the outside. 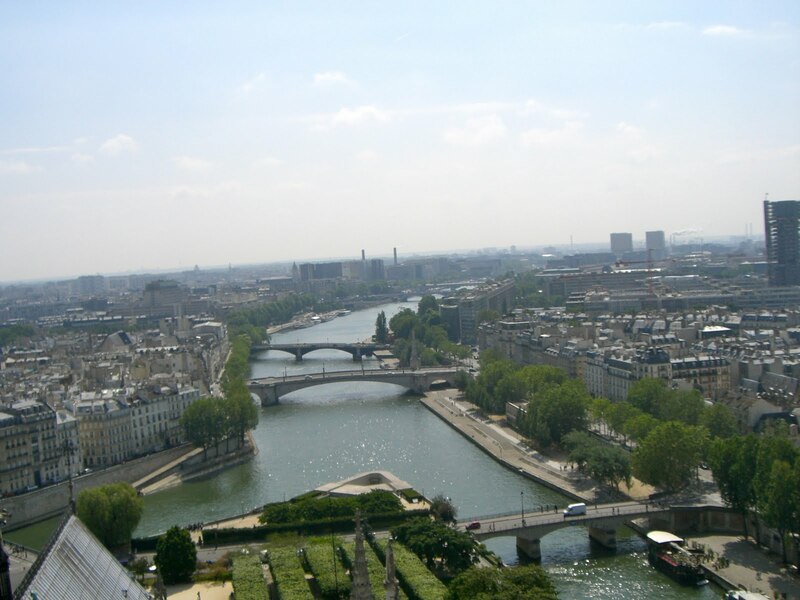 Once you get to the first level of the towers, you have an impressive view of Paris, with famous gargoyles along your side. After walking up a rickety set of wooden stairs, we reached the next level, which encompassed the bell tower. Only a few people were allowed on this level at once, considering the massive size of the bell and the tiny room. We then climbed even more stairs to reach the last level of the Notre Dame, where we had an impressive 360 degree view of Paris. Makes the intensity of the stairs so worth it. Another thing I can never forget about my trip to Paris was climbing up the Eiffel Tower. Tourists have the option to climb it, or take an elevator up to the top; we chose to climb up to the second level since it was only 4.5euro vs. 13.50 for the elevator ride. This was a great way to burn off some calories from all of the crepes we’ve been eating for breakfast, lunch, and dinner! 674 steps later, we finally approached the second level, with stunning views of Paris. We walked down the avenue of Champs-Elysee, which was full of designer stores and major car brands. Although we couldn’t afford anything, it was still fun to admire the luxury items in each store. One afternoon we took the train to Versailles, which was about 30-40 minutes away. The palace of Versailles is the largest one in all of Europe, thanks to King Louis XIV, the Sun God. We decided to do an audio tour, which led us throughout each room providing information. The Hall of Mirrors was gorgeous- with large chandeliers all throughout. We were able to view the royal chapel and rooms like the king and queens bedchambers. Once we were finished admiring the rooms (with the beautiful ceilings, priceless items, and so much history), we visited the garden. This garden is not what I think of as an average garden- it is over 2 miles! It is full of fountains, flowers in full bloom (we were lucky enough to be there during the summer), hedges cut to precision, trees cut in funky shapes, and sculptures. All in all, the Palace of Versailles, along with its massive garden, is pretty impressive. the ceiling itself was amazing! For our last night in Paris, we ate at an outdoor restaurant, I think in the Monmartre District. There were so many of these outdoor dining restaurants in a row, it was hard to chose one! After being pestered by each host, we finally chose one with a great price-fixe menu. We had an awesome waiter! I remember the bread being amazing. And for my last picture, an obvious and must-take in Paris. The Eiffel Tower and myself. I must say I wish I were able to spend a few extra days in Paris. The city is absolutely amazing, and there is so much more to see and do. Although we were able to see a lot, I feel like I wasn’t able to soak it all in since we were running around the whole time. Next time I go to Paris, I want the vacation to have a more relaxed vibe.